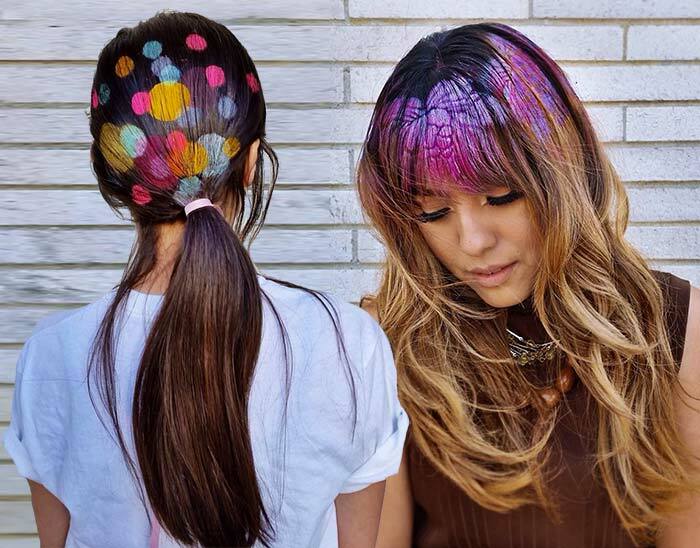 Hair stenciling is exactly what it sounds like; stencils are used to paint beautiful and colorful patterns and designs on the hair. 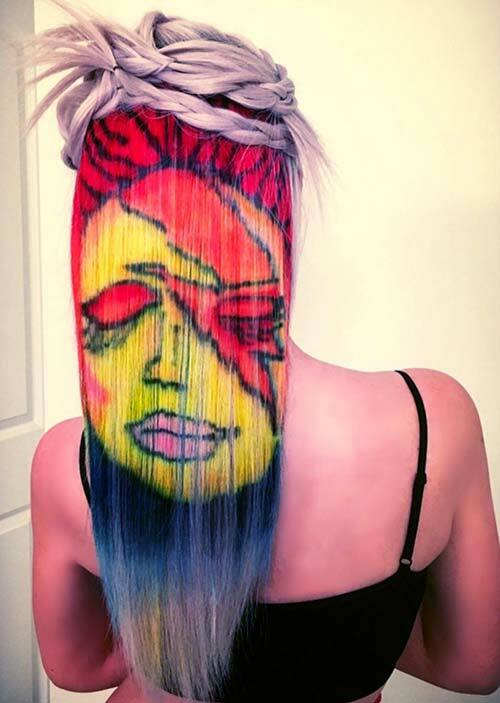 This hair art trend began with artist and hairstylist Janine Ker. 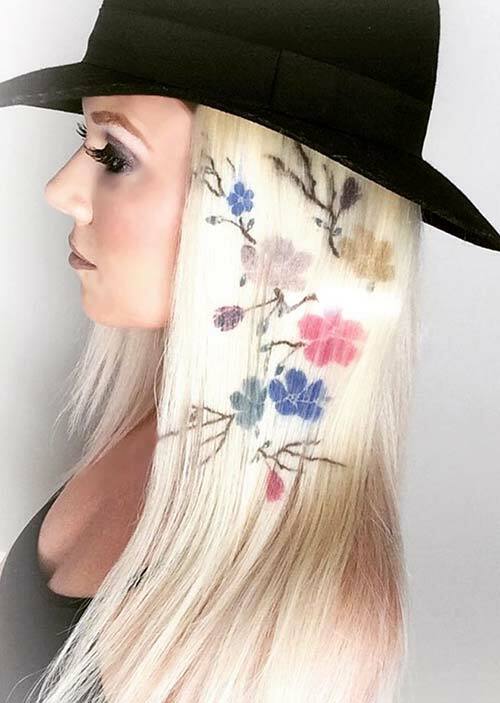 She began using hair stencils on her clients, and now that the results have made it big on her Instagram, it’s bound to be blowing up as well. There have been so many hair color trends in the past few years, so adding in another one now may seem like overkill. But hair stenciling actually acts more as an accessory than an overall hairstyle, and with the potential and beautiful outcomes it has already shown, we’re willing to let this one slide in, too. Ker generally uses temporary hair coloring products, so there’s no real commitment, but if you wanted you could use a more permanent product for the same effect, just longer lasting! But in order to spark your inspiration, here we have put together a list of 20 hair stenciling ideas that you will fall in love with. 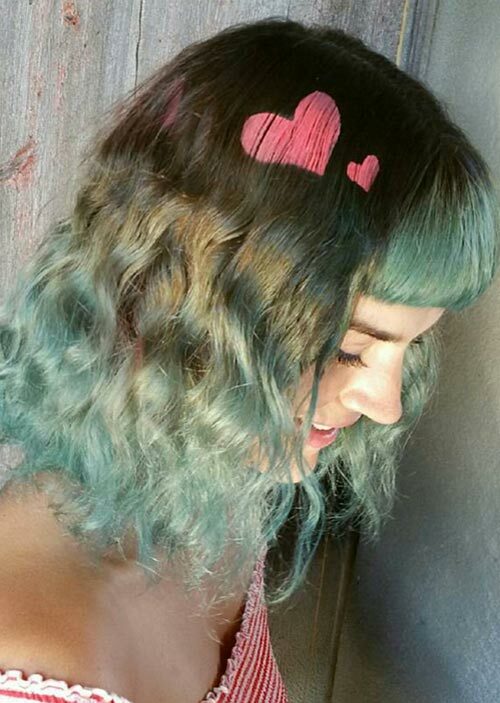 Hair stenciling can be as simple as adding in some cute hearts onto your already lovely and on-trend hair color. This is a style that we can expect to see at music festivals, especially country music, as that was the intent of the woman here. It’s a simple accessory to your hair, so you get a lovely design as a new trend without having to dye all of your hair. This is a well-integrated hair stencil, since it’s all in the underside of the hair, beginning near the tips and blossoming up toward the roots. This overall style, between the hair stencil and the natural flowing hair, is bohemian and almost edging into flower child ” if this trend had been around in the ’60s and ’70s, you can bet this would have been a popular style, especially at music festivals. 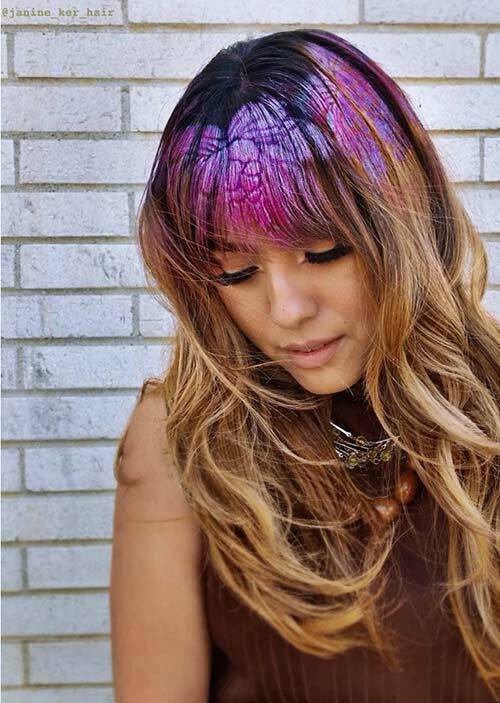 This hair stenciling idea is a magnified flower crown, with a beautiful, iridescent purple making up the tropical-looking flowers. Most notable on the bangs, the flower trims the hair tips, before circling around to the back. The idea behind this hair stencil is quite lovely, and could look great when set at different scales as well. What makes this hair stencil hidden is that it becomes visible mostly when styled with a top bun, like in this image; once that layer of hair is dropped, the color will be visible only in peeks, so you wouldn’t be able to make out the individual colors. This overall hairstyle has three great trends of today: Balayage highlights, the top knot, and now the beautiful hair stencils. 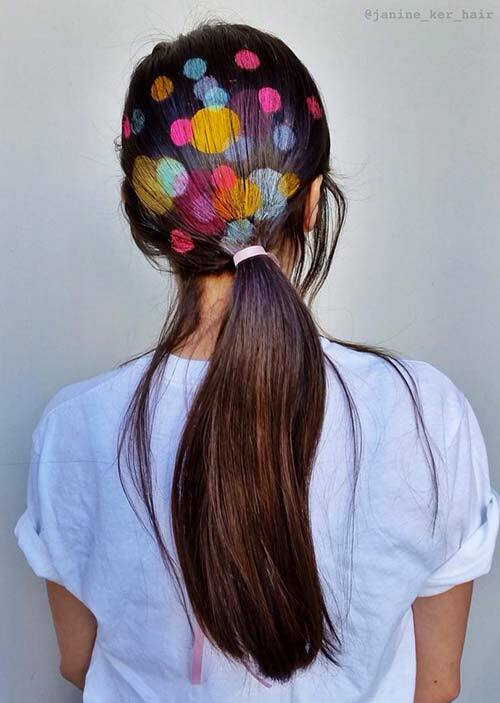 This is a fun hair stenciling idea, with perfect circles decorating the back of a tied-back ponytail. The overlapping polka dots are almost circus-esque, and also can just brighten up any look because of that. They will bring a smile to your face, and all of the color makes for the perfect summertime accessory, as long as you don’t wear other prints that day! 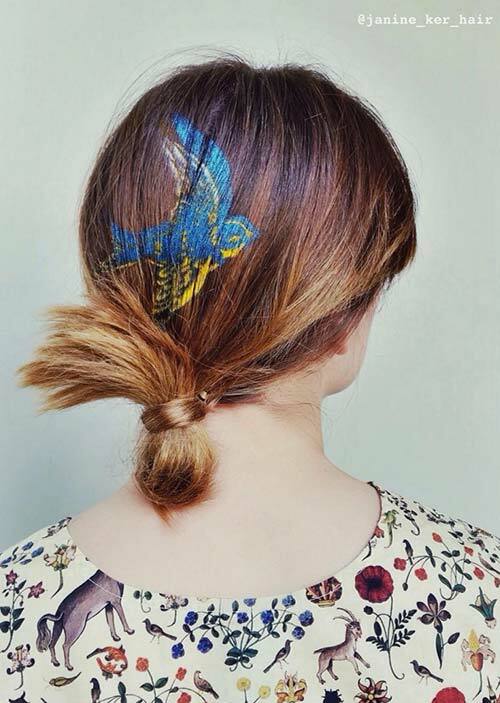 With this hair stencil you can enjoy the beauty of a bluebird, as well as the freedom birds tend to symbolize. And to top it all off, the stencil is super cute! The golden sketch around the border adds a great deal of movement and depth to the look as well, and is finished off beautifully by the bun it is styled with, as the flipped up hair itself resembles feathers. 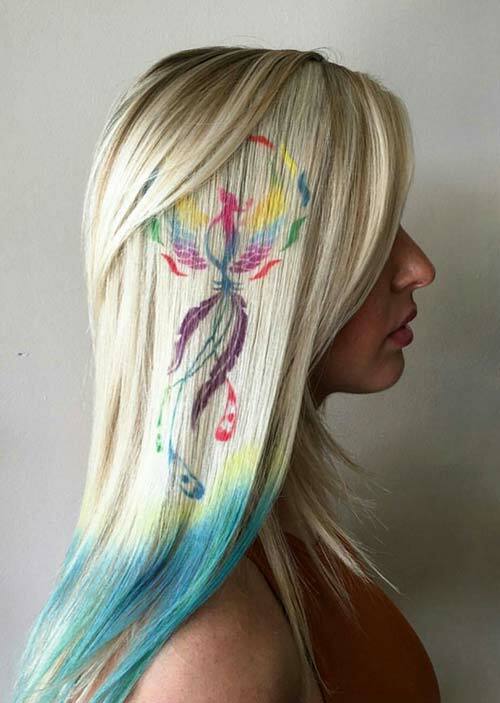 This is a hair stencil that appears to be a beautified image of a phoenix, in a rainbow of colors. Styled here with dyed blue hair tips and icy blonde hair, there is no better setup for this type of colorful stencil, especially when the blues tie so well together. 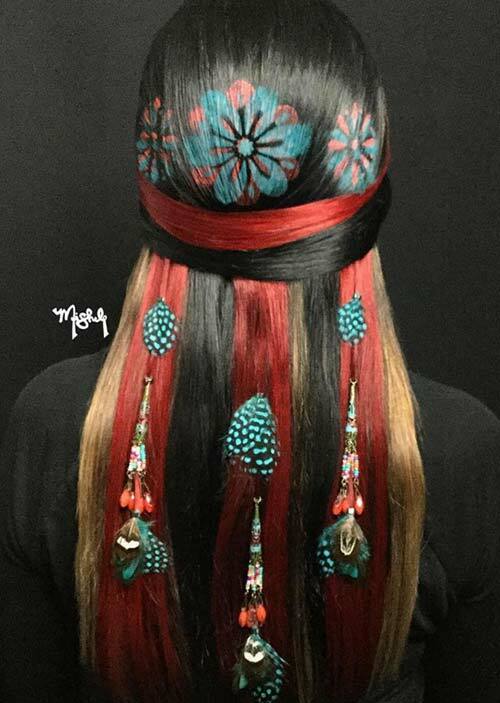 The tilde circle around the top of the bird and the feathers taking place of the tale make the stenciled hairstyle unique and beautiful as well. This is a large scale hair stencil that can only be made this beautiful with a tight hairstyle like the braids in this shot. The lustrous hues of the stencil are very intriguing and intoxicating to look at, especially due to the lovely partial symmetry so perfectly captured in this post. Such a look would also look great with a tight, low bun or other tightly pinned back hairstyles. 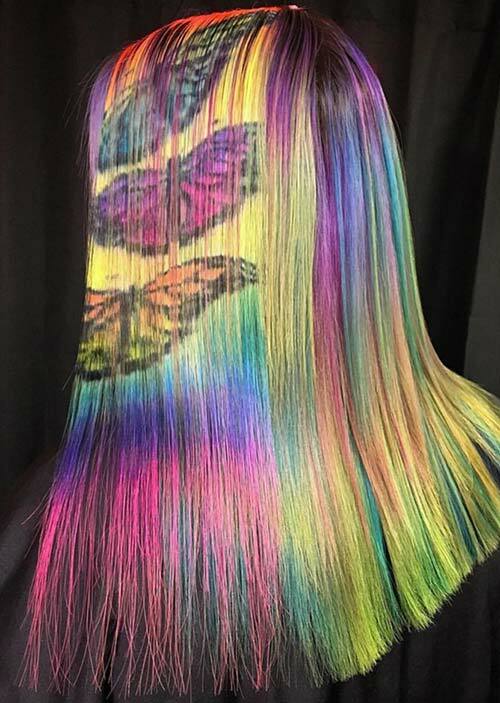 This style starts with a pastel mermaid hair coloring, with colors continuing into the lovely butterfly stencils. The colors within the images are the same colors as the hairstyle, but come from different sections of the hair, so the colors are interrupting the pattern of the rainbow hair while still staying integrated. So it’s just enough color to keep it intriguing without going overboard. Starting with a blonde-overlaid bob, this hair stencil is simple and totally adorable. 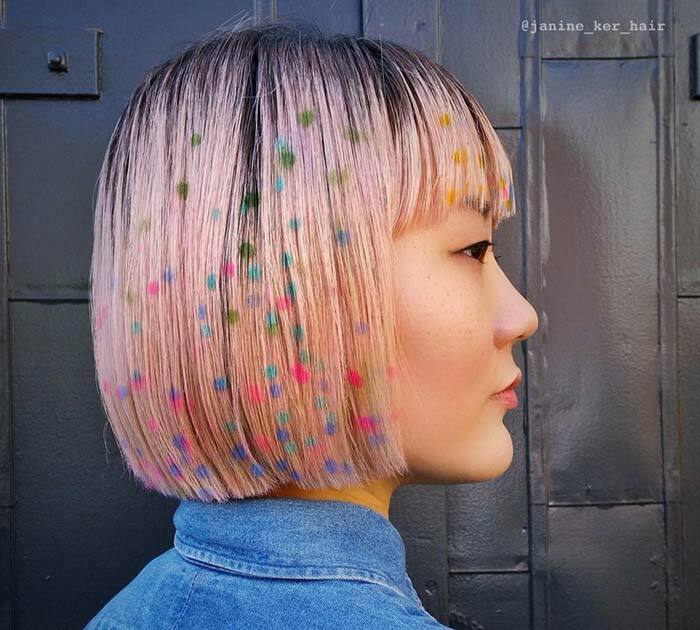 The colorful polka dots add some fun and whimsy to the overall hairstyle, and still maintain a certain structure, which comes through in the movement of the dots from the greens and yellows near the top to the softer pinks and purple shades closer to the bottom. 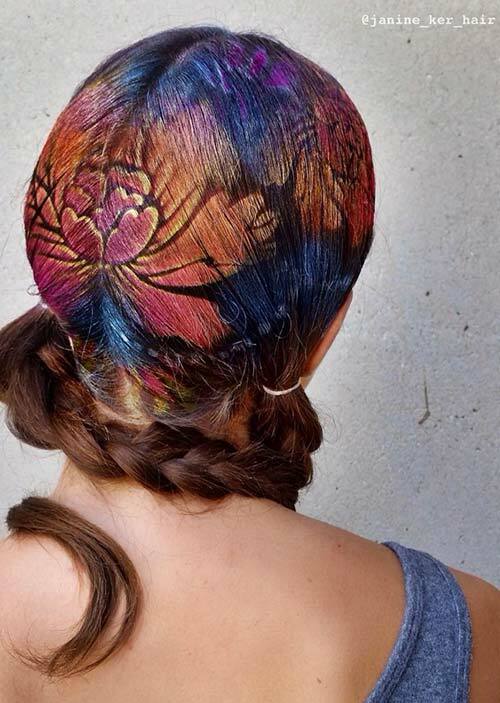 The most captivating part of this hair stencil hairstyle is the bold color choice. The deep red plays very well against the black majority, and against the outline of blonde that also comes through from underneath. The floral stencils near the top are pristine and bring in a beautiful blue as well as the deep red. The tribal aspect is solidified thanks to the feather accessories hanging at the base of the style. 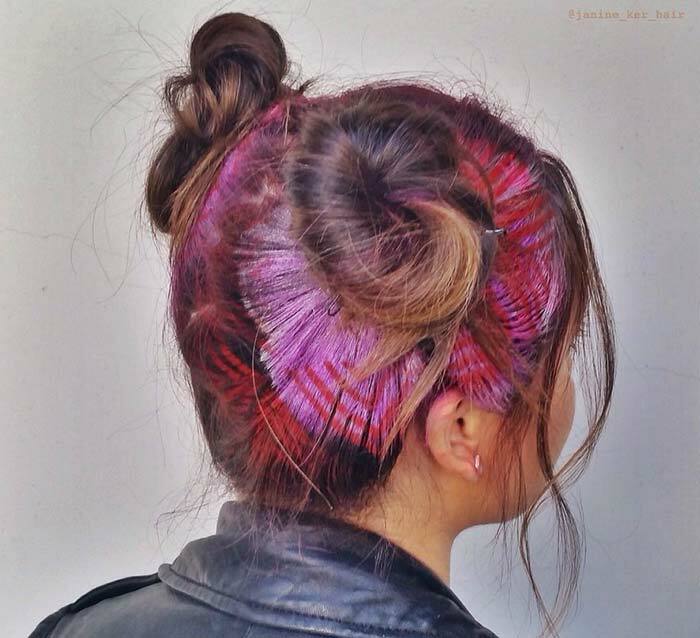 Already a girly punk-rock hairstyle with the twin buns tight on top of the head, this hair stencil made with pink and red shapes and lines adds even more depth and intrigue to the look. The red lines play with the large pink shapes, which all work around the buns. It’s adding a trend of today on an already trending hairstyle that’s always been a part of hair culture, so you can’t go wrong! This is a hair stencil that works particularly well on short hairstyles. Only traced onto the bangs falling into the face, it allows the simple lines of the stencil to stand out and add some dimension to hair that otherwise might be boring. Although, the color of the hair certainly plays into this interest and intrigue as well. This stencil would also look lovely if adapted and implemented on long hair. If you’re looking for a cute and quirky hair stenciling idea to finish off your look, this simple white hair stencil is a great bet. 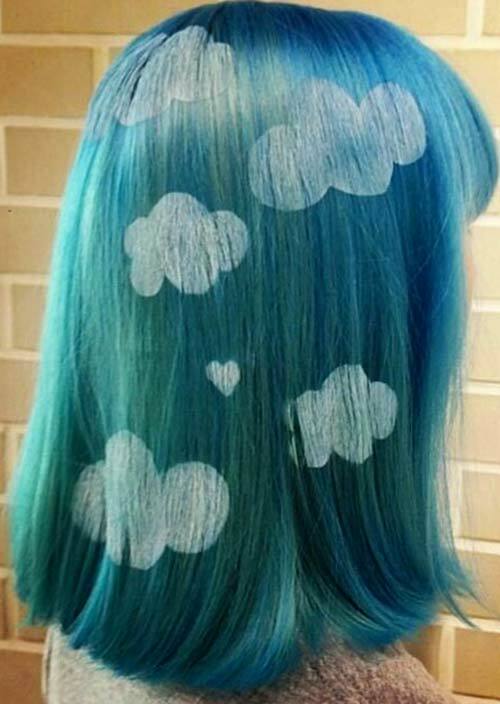 The clouds and tiny hearts have just enough character to bump up your look, especially when you have the blue hair to emulate the perfect daytime sky. You can’t get much more cohesive and integrated than an everyday image like this! 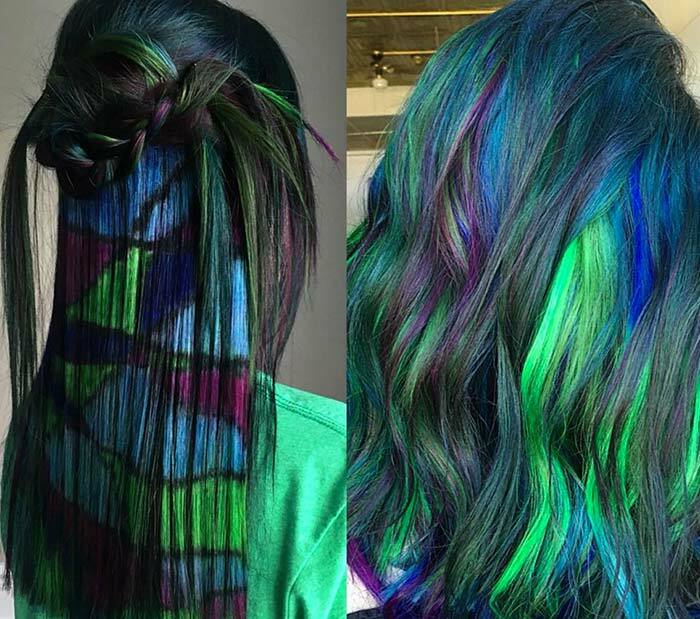 The sharp, abstract lines of stained glass are always beautiful, and now we can see that that fact is especially true on colorful mermaid hair as shown in this picture. It gives the opportunity to structure the color into an organized pattern, while still being beautiful when styled any different way. It won’t be nearly as edgy and striking on curly hair, but the effect will still be true. 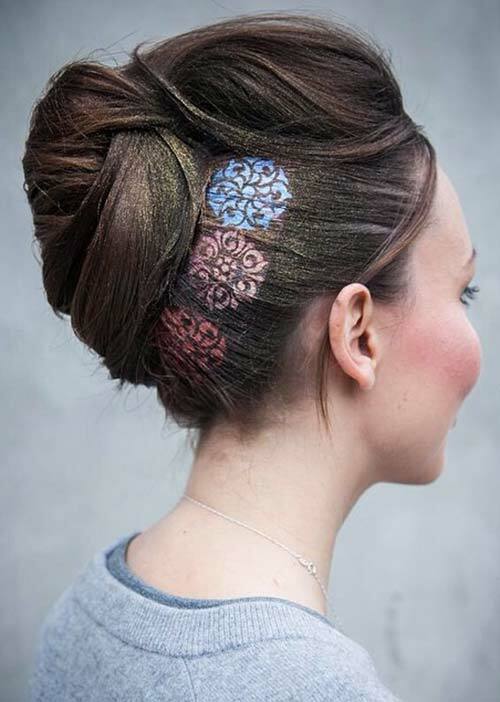 This hair stenciling trend was created to trace and complement this lovely updo. 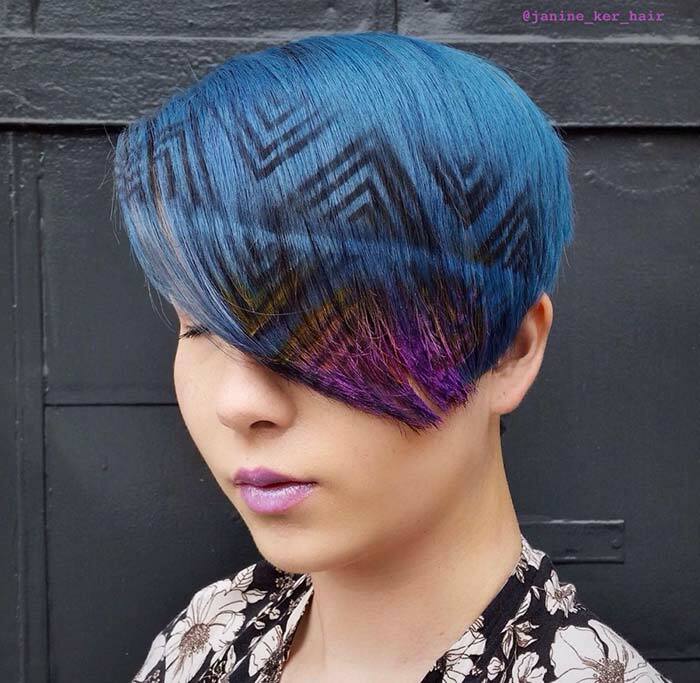 As many of the hair stencils in this list serve to stand out or be the focal point of the hairstyle, this one goes against in the grain, in that it supplements the already beautiful hairdo while adding in a beautiful image of an abstract sun and also bring some color into the look. The hair stencil here is made especially bright and beautiful thanks to the icy blonde hair color. 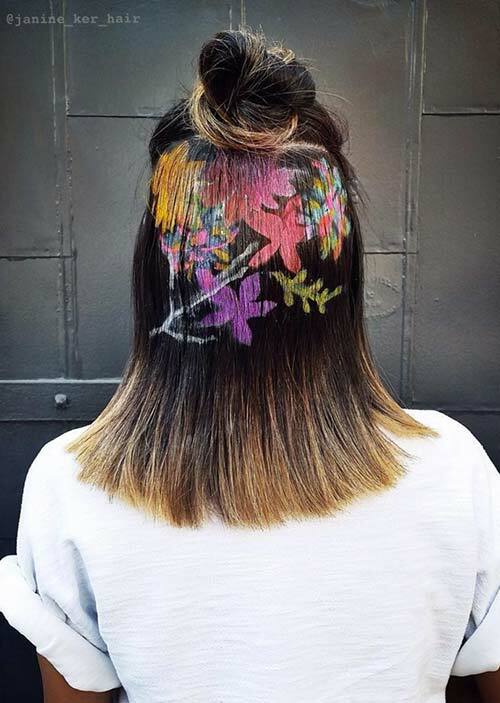 It makes it so the colors of the hair stencil don’t have to be overly bright or dramatic, and the simple bloom and branch setup to the style is even more captivating because of that. It’s a simple, light, and breezy addition to your spring and summer looks. 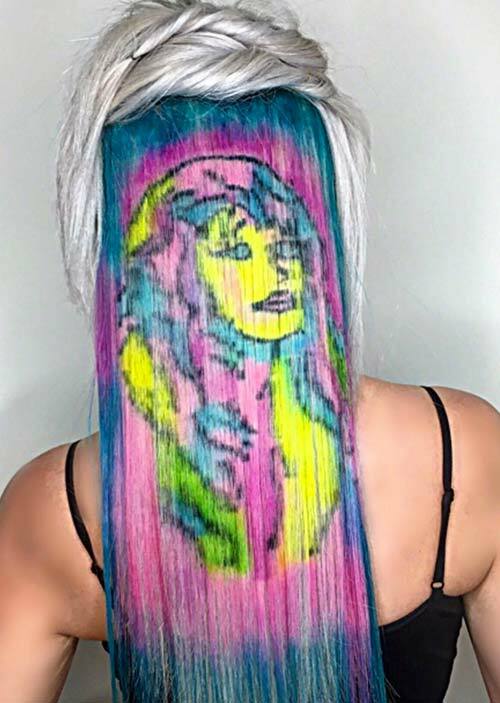 This hair stencil might seem a bit off-putting at first glance, but the artistic integrity of the whole thing is the true selling point as an overall style. The image is a mash-up between two of the most unique musicians in music history, and especially at music festivals the look is going to make a loud statement. It’s a bold look that holds a lot of meaning as well, especially with the color choice. Another bright hair stencil of an iconic music sensation, Stevie Nicks has been an inspiration to so many people and to so much within the music industry. 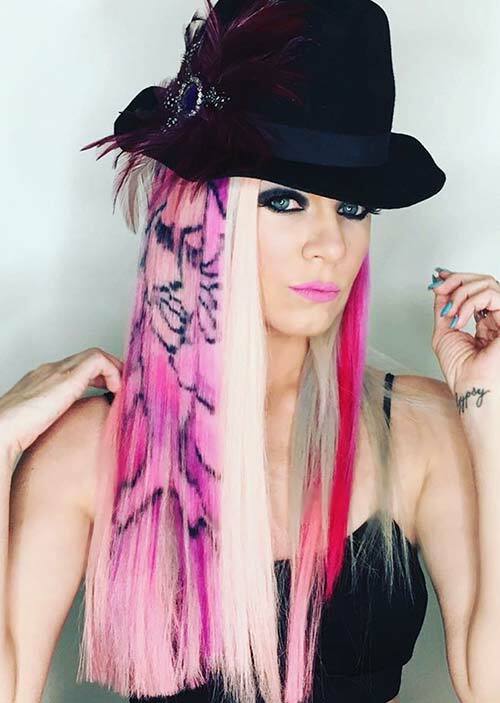 This stenciled hairstyle is more beautified than the previous item in this list, with pastel colors at the base, spewing from icy blonde hair at the top. The color is just as inspiring here as the woman represented on the hair. Yet another iconic celebrity, Jeffree Star is definitely a multitasker across industries. As a singer/songwriter, makeup artist, fashion designer, and drag model, he has made his mark on the world of celebrities, and is continuing creating a lasting impression on the world. His face here is seen on a simple panel of pink amid platinum blonde hair, which creates a great impact, much as the man himself.